The 60,000 sq. ft. under roof at Sko-Die Inc., Morton Grove, IL, house more than 20 presses, in capacities from 5 to 440 tons. The gap and straightside mechanicals, and a servo model—part of a tandem line—deliver bed sizes to 120 in. across and zoom at speeds to 300 strokes/min. The variety of equipment at this suburban Chicago metalformer enables production of stampings large and small, in runs from prototype to high-volume via progressive, compound and notching dies, many built and services inhouse in Sko-Die’s full-service toolroom. Owned and operated by the Steininger family since it opened in 1947, Sko-Die also performs laser cutting, welding and machining to produce tooling, finished parts and assemblies. Though it has the capabilities to perform all kinds of work, custom steel laminations represent more than 50 percent of all Sko-Die stampings. These are produced primarily from 0.005- to 0.025-in.-thick silicon-alloy steels and ultimately find their way into customers’ motors and generators. The company also performs work for the aerospace industry using hot-rolled steel, from 0.110 to 0.320 in. thick, in compound dies. Sko-Die traditionally has been able to draw work from OEMs’ captive stamping departments, offering its range of capabilities to perform their operations on its own presses. But recently, the company had been forced to turn away or outsource work on larger dies due to lack of bed size in its presses, according to Patrick Steininger, Sko-Die president. “We were having to send stamping work out and turn down jobs because the dies were too large for our presses, and we needed to remedy that,” he recalls. So in 2014, the company undertook a quest for a new press with the bed size it needed, along with new technology that would keep the company on the leading edge of the stamping industry. “We also looked to boost our tonnage capacity,” Steininger adds. At Sko-Die, a 440-ton press, installed at the end of 2014, anchors a press line that includes coil-feed capability in material widths to 36 in. The company uses the line to produce laminations in progressive dies previously outsourced due to their large size. The press’ larger bed resolved that problem. Ultimately, Sko-Die chose to partner with Aida-America (Dayton, OH). 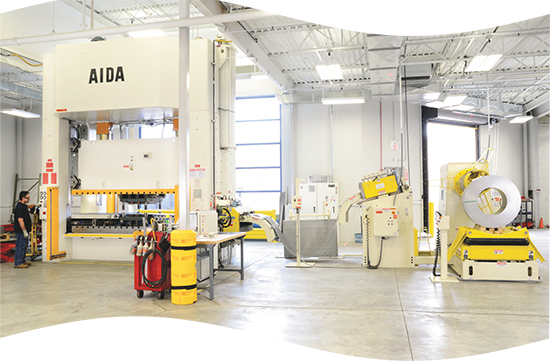 The result: a new 440-ton Aida MCX-S2-4000 two-point mechanical straightside press. The press, humming along at speeds from 20 to 60 strokes/min., has the bed size that Sko-Die requires, 120 in. left to right and 59 in. front to back. Standard benefits include a rigid frame, counter-rotating eccentric gears, self-contained counterbalance cylinders, ball-and-socket connections and hydraulic overload protection. Installed at the end of 2014 and now operating at full tilt, the press runs progressive dies and coil to 36 in. wide in thicknesses from 0.014 to 0.025 in. Nourishing the press is a new feed line from Coe Press Equipment (Sterling Heights, MI), supplied through Stamping Systems (Rolling Meadows, IL). The line includes a Servomaster three-roll feed, capable of handling material widths to 36 in., along with a threading table, power straightener and 10,000-lb.-capacity coil reel with coil car. Along with the new press, Sko-Die has been adding electric shaker conveyors, M-series models from Magnetic Products, Inc. (Highland, MI). The shakers bring flexibility to the company’s operations without the downtime needed to maintain traditional conveyor systems. Plugging into standard 110-V outlets, the shakers can function on low-volume applications as well as central scrap-removal systems that may have to move thousands of pounds of material each hour. Besides a compact footprint and quiet operation, benefits of the shaker include the ability to operate without the need for maintenance, spare parts or lubrication, according to Magnetic Products officials. “We move those shakers to wherever they are needed,” Steininger explains, commenting on their portability, a big selling point for Sko-Die. One sticking point during this project: Sko-Die did not have the ceiling height to accommodate a new press. To remedy that and to fit the entire press line, the company built a 4000-sq.-ft. addition with a canopy over the press. Steininger credits the work of general contractor Herron Construction Co., Island Lake, IL, in smoothing the process. Since overcoming that construction challenge, Sko-Die has moved full bore into the lamination big-die business. Each lamination die typically produces a set of two parts, stator and rotor laminations, with individual die stations performing blanking, stator slot cutting, stator ID punching and perhaps rotor hole punching. From there, the parts may be drop-shipped for rotor diecasting or delivered to the customer for motor production. Though exclusively producing laminations, Steininger notes that the new press offers the tonnage, stroke length and control capabilities to produce other types of parts using various forming processes should the need arise. Besides a larger bed size and increased flexibility, the press also brings another benefit: increased die life. See also: Coe Press Equipment Corporation, Magnetic Products, Inc.